Representative Cindy Evans serves as the Chair of the House Committee on Economic Development and Business. She is a veteran legislator serving her eighth term in the Hawai‘i State House of Representatives representing North Kona, North Kohala, and South Kohala on the Island of Hawai‘i. The growing West Hawai‘i district has over 28,000 residents and includes the Pohakuloa Military Training Area, Kawaihae Harbor, the famed resorts of the Kohala coast, pristine shorelines, prime agricultural and pastoral lands, and significant historical and cultural heritage sites. Formerly, Evans served as House Majority Floor Leader (2014-2017 and 2009-2012), Chair of the House Committee on Water & Land (2012-2014), and Chair of the House Committee on Public Safety and Military Affairs (2006-2008). As Chair of the House Committee on Public Safety and Military Affairs, Evans attended the christening of the Virginia-class nuclear attack submarine USS Hawai‘i (SSN 776) berthed at the General Dynamics, Electric Boat Shipyard, Groton, Connecticut on June 17, 2006, and was a guest onboard the USS Ronald Reagan aircraft carrier (9CVN-76) during RIMPAC 2012. Evans facilitated a Veteran & Military Appreciation Day, including a Hire a Hero Job Fair, on November 3, 2012. Representative Evans has represented the State of Hawai‘i internationally. She was one of twelve elected officials nationwide chosen to participate in the 2009 NCSL sponsored Saudi Arabia Exchange Visit. The group visited the Saudi Arabian Investment Authority, the King Faisal Specialist Hospital, and the newly opened King Abdullah University for Science and Technology, the first co-educational institution of higher learning in the Kingdom’s history. Delegates also met with Saudi officials, including their counterparts at the Majlis al Shura, Saudi Arabia’s legislative body. In May 2014, Evans was part of a delegation of legislative leaders to represent the State of Hawai‘i in Taiwan and Japan. Representative Evans is a graduate of Evergreen State College with a B.A. in Business Management. She is also a graduate of the Western Legislators Academy, and the Council of State Governments Henry Toll Fellowship program which is one of the nation’s premier leadership development programs for state government officials. This year, Representative Evans participated in the Leaders Program, National Conference of State Legislators. She also is an active member on the Council of State Governments and Vice Chair for the State & Federal Relations Committee. She was a former Trustee for the Historic Hawai‘i Foundation, past-President of the Waikoloa Village Outdoor Circle, and former Board Member for Mental Health Kokua. By IVY ASHE Hawaii Tribune-Herald HAWI — The future of affordable housing on Hawaii Island could be tiny. Legislation introduced this session by Rep. Cindy Evans (D- North Kohala, South Kohala, Kona) would allow for so-called “tiny homes” — houses that are less than 500 square feet — to be built on agricultural-zoned land for farm workers. House Bill 2 is specific to Hawaii Island. A second bill, House Bill 1373, would authorize counties to provide zoning exemptions for tiny houses. On Saturday, Evans, as well as Hawaii County Councilman Tim Richards and representatives from Hawaii County Councilwoman Jen Ruggles’ office, attended a community meeting hosted by One Island, a South Kona-based sustainability and education organization, to discuss the legislation and how to support local tiny homes. 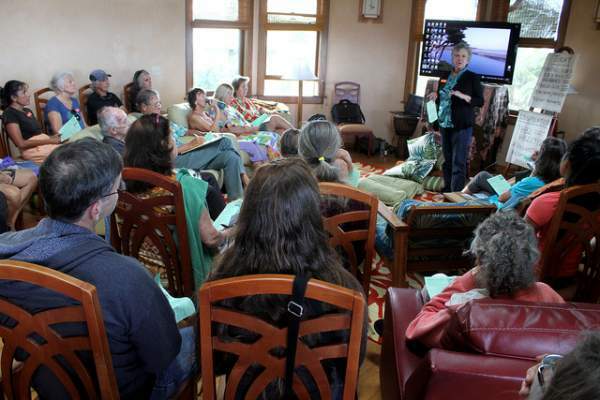 Held at the Algood Farm in Hawi, the meeting drew about 40 attendees from around the island, with Puna, Hilo, Honokaa and Waimea represented. Tiny houses have become more common across the country over the past decade; in 2015, more than 60,000 people attended the National Tiny House Jamboree in Colorado. In some cases, the houses are the choice of minimalists seeking to downsize, or environmentalists seeking a lower carbon footprint. In other cases, people build their own tiny homes to avoid having a costly mortgage. One Island became interested in tiny houses as a potential answer to a problem many farmers in Hawaii are familiar with: finding affordable housing for employees. The organization has a 10-acre farm in Honaunau; one of its goals is finding solutions to Hawaii’s ongoing food security challenges. Richards said he also saw tiny housing as a way to address Hawaii Island’s existing homeless population as well as people vulnerable to homelessness because they cannot afford rising rent. “It started with farming, but it has so many other applications,” said One Island co-founder Marcy Montgomery. Evans has introduced similar measures before, which she said tend to raise concerns from those in the hotel and time-share community about whether the housing would be used for vacation rentals. “They play by the rules, and they’re concerned when people don’t play by the rules,” Evans said. Saturday’s session was intended as a starting point for raising awareness of the new legislation. Barrie Rose and Johanna Tilbury of Habitats Hawaii, which designs and builds mobile tiny homes on the Big Island, gave an overview of some of the housing they have worked on over the past several years. The homes cost between $55,000 and $80,000 and are solar-equipped with full electricity and plumbing. The homes, which Tilbury and Rose presented on a slideshow, were individually designed and featured everything from lofted space to skylights to small breakfast nooks. One home, originally built in Waimea, has since moved to five different locations. “These aren’t just little boxes,” Rose said. State Rep. Brian Lee has also expressed support for the project, as have state Senators Mike Gabbard, Josh Green and Russell Ruderman. A second tiny house community session will be held in Honokaa from 6:30-8:30 p.m. Feb. 22, at the Hawaiian Cultural Center of Hamakua. For more information, visit http://www.oneisland.org/…/home-is-where-the-farm-is-tiny-h….... Email Ivy Ashe at iashe@hawaiitribune-herald.com. The scholarship is accepting applications for the 2017-2018 school year. It is open to any Big Island high school senior who will attend an accredited two or four year college/university. 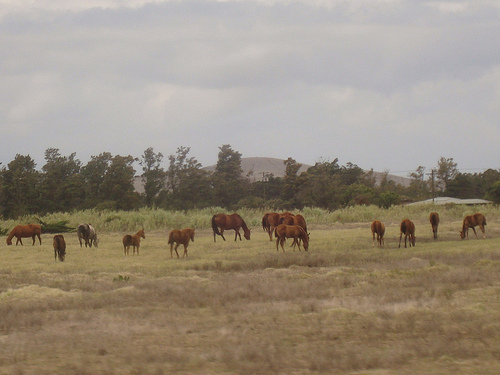 The student must be raised on the Big Island and have a background in ranching, cattle and or horses. The fund will provide $2000 per year to assist with tuition. The deadline for submission is June 1st and the award will be made on July 1st. This scholarship was created in memory of Gusatv "Dutch" Schuman, the third-generation leader of Schuman Carriage Co; owner of the SC ranch, Pa'auilo, Big Island; and former Hawaiian Home Lands commissioner. Throughout his life Dutch's true passion was with horses and cattle. While he was successful businessman, he was a cowboy at heart. He loved every aspect of ranching, and took particular interest in encouraging younger generations to pursue their interests in animal husbandry. This scholarship fund is dedicated to preserve Dutch's legacy, and to acknowledge his numerous contributions to the people of Hawaii. Please write to dutchschuman@outlook.com to obtain the application or call Rich Smylie, 808-381-2950. A community conversation on the topic of Tiny House Solutions will be held to explore innovative affordable housing. This is an open forum for the community to participate in, to learn more and discuss what can be done in North Hawai'i for affordable and alternative housing options. State Representative Evans will be in attendance to show her support for Tiny House Solutions. If you would like more information on the event, please visit www.oneisland.org. To RSVP and get directions, please e-mail greenschool@oneisland.org. State legislators are taking dead aim at albizia trees in response to the devastation wrought by the invasive species following Tropical Storm Iselle. A total of nine bills directly targeting albizia have been introduced for the 2015 session, including identical companion bills in the House and Senate seeking $2.1 million to remove the most dangerous trees that remain standing near Hawaii Island roadways.